Home → Past Events → Oh, Mr. Faulkner, Do You Write? 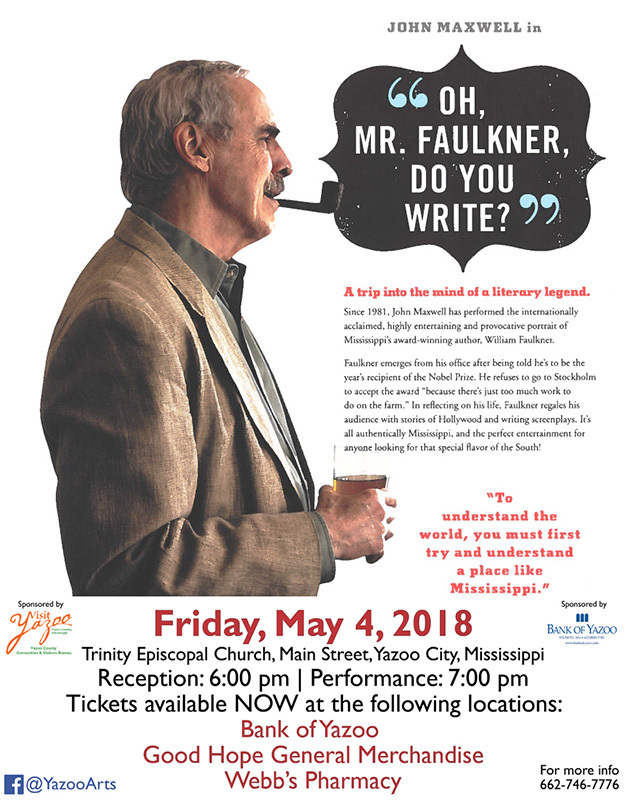 Audiences in Yazoo City will have a unique opportunity to meet one of America’s greatest writers on Friday, May 4th, at 6:00 pm at Trinity Episcopal Church. John Maxwell’s internationally acclaimed one-man play on the life of the Nobel Prize-winning author, William Faulkner, will be presented by the newly revived Yazoo Arts Council, a non-profit organization whose mission is to promote the arts throughout Yazoo County, Mississippi. Maxwell has been presenting his highly engaging, entertaining, provocative and moving performance of America’s most decorated novelist for twenty-five years. He has traveled to twelve different foreign countries and most all of the United States with his performance. Maxwell stresses that this is a theatre piece; it is not meant as an academic thesis on the works of Faulkner. “It’s about his life and about the stories in his life,” says Maxwell. In the play, Faulkner emerges from his office after having refused to go to Stockholm to accept the Nobel Prize. “I have too much work to do on the farm. They can send it to me in the mail.” He goes on to tell stories about his days in Hollywood writing screenplays for Howard Hawked, Humphrey Bogart and Clark Gable; about his days in Oxford, Mississippi with his family; a Question/Answer session with an imaginary English class; as well as opinions on the black man in the south, writing in general, and many other things. In the end, Faulkner changes his mind, does go to Stockholm, and the play concludes with The Nobel Prize Acceptance Speech, considered by many as the finest speech of it’s kind ever written. Come to Trinity Episcopal Church in Yazoo City on May 4, 2018, and have the opportunity to laugh, and be entertained with this dynamic theatrical presentation! The Yazoo Arts Council was formed in 1975 to promote the arts throughout Yazoo County by nurturing awareness through exposure, enjoyment, and involvement in visual and performing arts. Membership in the Yazoo Arts Council is open to all individuals, organizations, or businesses interested in the mission and vision of the YAC. Those interested in purchasing membership can contact the YAC through their page on Facebook at www.facebook.com/yazooarts or by mail at Yazoo Arts Council, PO Box 207, Yazoo City, MS 39194.